January 2002 News | Piping Technology & Products, Inc. 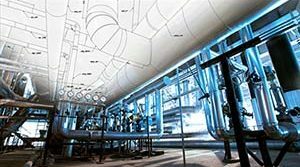 Piping systems are used to transport gases, liquids and suspended solids between units of a plant. The temperatures of the contents and the pipe when the plant is in operation are often quite different from the ambient temperature of the surroundings. The heat transferred during changes in temperature causes metal pipe to expand and contract. Piping designers must provide for movement due to temperature changes and forces caused by pumps, gravity and other elements of the piping system.Read PT&P’s “How to Size a Spring Hanger” Technical Bulletin for more information. These constants are an essential component of the radiant-tube support system for a reforming furnace. 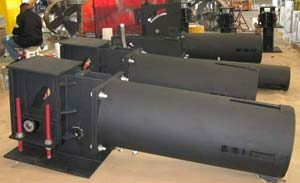 Piping Technology custom designed these units to fit in the limited space available inside the furnace. The bolting patterns for the constants needed to be flexible enough that they could be attached to the supporting structure with any of the support system designs being considered. Piping Technology & Products, Inc. uses the “sandwich” concept when applying slide plates to our customers ‘ systems. Figure 1 shows a “sandwich” composed of two identical slide plates, one on top and another on the bottom. Each slide plate (which is like the bun of the “sandwich”) and a low coefficient of friction material which is bonded to the metal backing plate. In a typical application a slide bearing plate is welded to a structural steel member which is strong enough to provide the required support, but whose coefficient of friction is too high. Figure 2 shows an application in which a slide bearing plate is welded on top of one steel beam supporting the other beam. When the top beam moves (due to thermal expansion, for example) it slides across the surface of the bearing plate without contacting the supporting another beam. To return to our “sandwich” metaphor, the top half of the “sandwich” is bonded to the sliding beam, and to the bottom half to the supporting beam. Want to learn more about spring hangers? Visit our webinar archives today!